BGA Socket suits 1.00 mm pitch devices. Designed for development, test, and validation of BGA and LGA devices at speeds up to 2.6 GHz, Flip-Top(TM) BGA Socket requires no soldering of IC and needs no external hold-downs or tooling holes in PCB board. It features single-ended insertion loss of -.060 dB at 2.6 GHz and differential insertion loss of -2.80 dB at 5.0 GHz. Available for thru-hole or surface mount applications, unit includes solder ball terminals, finned heat sink or coin screw, and spring pin technology. 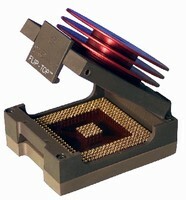 West Warwick, RI, May 9, 2006 - Advanced Interconnections Corp. recently launched the next generation Flip-Top(TM) BGA Socket. Designed for development, test and validation of 1.00mm pitch BGA and LGA devices at speeds up to 2.6GHz (single-ended), the compact design requires no soldering of the IC and needs no external hold-downs or tooling holes in the PC board. The new series is available for either thru-hole or surface mount applications. Unique features include solder ball terminals (traditional Sn/Pb or new lead-free Sn/Ag/Cu), an integral finned heat sink or coin screw, and patented spring pin technology that matches the device footprint. Advanced Interconnections Corporation is an ISO 9001:2000 Certified designer and manufacturer of electronic interconnect solutions, with world headquarters located in Rhode Island (USA). For more information, contact Advanced Interconnections' customer service department at 5 Energy Way, West Warwick, RI 02893 USA. Tel: (800) 424-9850 or (401) 823-5200 or Fax: (401) 823-8723. E-mail: info@advanced.com. Product information available online at: www.bgasockets.com. Flip-Top is a trademark of Advanced Interconnections Corp. We do not publish pricing in product news releases.